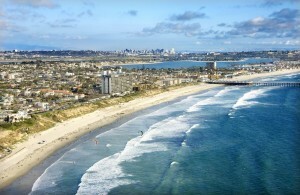 Bounded on the north by La Jolla and on the south by Mission Beach, Pacific Beach is primarily residential and is transitioning from its primarily young, college age and surfer population to a slightly older and more affluent professional residential mix of students, single professionals and families. Still, the neighborhood is home to one of San Diego’s more vibrant nightlife scenes, with a substantial number of restaurants, bars and boutiques. 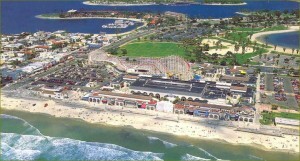 The area’s boardwalk, Ocean Front Walk, runs for over three miles along the seemingly endless beach and hosts numerous shops, restaurants and bars. Mission Beach occupies approximately two miles of oceanfront and is literally built on the sand. Although land sales in the neighborhood began around 1914, most of the surviving structures date from the 1930s and ’40s, with a very few as old as the 1920s. Because lots are small, many of the original cottages have been reconstructed as two-story homes. Mission Beach is the most densely populated neighborhood in San Diego.